Like all of the socialist governments of Eastern Europe, the Czechoslovakian regime used its intelligence and security services to clamp down on political dissent from the time it eliminated its opposition in 1948, until it was finally deposed in 1989. Although the scope and tactics of the Czech Statni Bezpecnost (StB) never reached the extent of its secret-police counterparts in East Germany or Romania, political repression was a feature of daily life in the country for its citizens. After the socialist regime fell in the peaceful Velvet Revolution of late 1989, the new, democratic government moved quickly to reorganize its security and intelligence operations and implemented a novel program to purge former high-level collaborators with the StB from retaining their public posts. After assuming power in disputed elections in 1948, the Czechoslovakian Communist Party ruled the nation as a satellite of the Soviet Union. Its foreign and domestic policies closely followed that of its dominant partner and the Czechoslovak regime consistently passed intelligence information to the KGB. The brief period of reform in the Czechoslovakian Communist Party under Alexander Dubcek (1921–1992), known as the Prague Spring, came to an abrupt end with the Soviet-led Warsaw Pact invasion of August 1968. The government reverted to its former repression and maintained a network of informants working for the Statni Bezpecnost (StB), or secret police, which had its own staff of about 17,000 agents. The operatives were active in reporting and suppressing dissent among religious, academic, and political groups. The regime also maintained a higher standard of living compared to other Soviet-bloc nations, which further helped to diminish political opposition. The combination of repression and material incentives succeeded in stifling the once-restive Czechoslovakian people through the 1970s and well into the 1980s. Domestic reform movements overturned the socialist regime with surprising swiftness and nonviolence during the Velvet Revolution of late 1989, when dissident writer Vaclav Havel emerged as the nation's president. In 1992, Havel also presided over the separation of Czechoslovakia into the independent entities of the Czech Republic and Slovakia. The government of the new Czech Republic maintained the four intelligence agencies that were established in May 1991. Two of the agencies, the Czech Security Information Service (Bezpecnostni Informacni Sluzba, or BIS) and Office for Foreign Relations and Information (Urad pro Zahranicni Styky a Informace, or USZI), gathered domestic and international information related to the protection of democracy, national interests, and human rights. The other two agencies, the Intelligence Service of the General Staff (Zpravodajska Sprava Generalniko Stab, or ZSGS) and the Military Defense Intelligence Agency, gathered information related to military interests. In contrast to the StB, the new civilian agencies did not retain executive powers of arrest and detention and were pledged to maintain the Constitutional rights of every citizen. The agencies also faced the challenge of training their new personnel in intelligence technology and surveillance and enlisted the aid of the United States, Great Britain, and the Netherlands in providing technical training in the 1990s. Another major task of the new democratic government was implementing the lustration law passed in October 1991. Under the lustration process those who were found to have collaborated with the secret police during socialist rule were barred from a number of public posts, including the state's judicial system, central bank, and other high-level civil service, military, and academic posts. Through the expiration of the law at the end of 2000, over 300,000 lustration investigations took place under the Civic Forum, an independent commission. Less than five percent of the cases resulted in findings of collaboration with the StB and ultimately only about one hundred people were barred from their positions at the conclusion of their hearings. Other European countries adopted similar lustration laws during their transitions to democracy, including Hungary, Bulgaria, and Poland. The process went the furthest in the former German Democratic Republic (East Germany), where the Gauck Authority disseminated information from the Ministry for State Security (or Stasi) files. 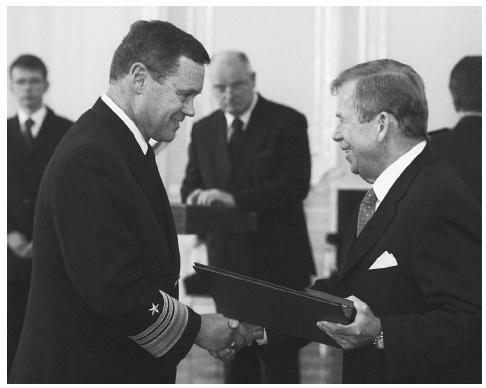 During a 2002 ceremony, former Czech President Vaclav Havel, right, presents Vice Admiral Thomas R. Wilson, director of the U.S. Defense Intelligence Agency (DIA), with the Order of the White Lion for his contributions to Czech defense and intelligence in Prague. Ulrich, Marybeth P. Democratizing Communist Militaries: The Cases of the Czech and Russian Armed Forces. Ann Arbor: University of Michigan Press, 2000. Williams, Kieran and Dennis Deletant. Security Intelligence Services in New Democracies: The Czech Republic, Slovakia, and Romania. New York: Palgrave Macmillan, 2001. Central Europe Review. "A Scorecard for Czech Lustration." Kieran Williams. November 1, 1999. < http://www.cereview.org/99/19/williams19.html > (March 6, 2003). Czech Security Information Service. "Intelligence Means." < http://www.bis.cz/eng/a_prostredky.html > (March 6, 2003). ——. "Terrorism, Extremism, and Organised Crime," < http://www.bis.cz/eng/a_ismy.html > (March 6, 2003). Federation of American Scientists. "Czech Republic: Intelligence." John Pike. January 5, 2003. < http://www.fas.org/irp/world/czech/ > (March 6, 2003).